Devices registered on the Senet Development Portal can be configured to forward sensor data to a ThingSpeak (www.thingspeak.com) Channel. Before configuring your notification target, you must create a Channel within your ThingSpeak account and define the number of fields that will be forwarded. If your device does not implement the Senet Packet Format then only one field need be enabled and the message PDU or payload will be forwarded as "Field 1". If your device implements the Senet Packet Format then the message PDU will be decoded and sensor values forwarded in "Field 2-6". 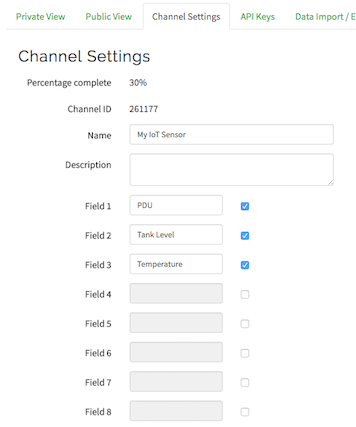 The Senet Packet Format supports multiple sensor data points in a single message PDU so make sure that you have configured the appropriate number of fields. If there are not enough fields configured on your ThingSpeak Channel then the update will fail. The example below implements two sensor values, Tank Level & Temperature. Login to the ThingSpeak platform, select the "New Channel" button to view the Channel Settings page. Specify the name of your channel and provide a description. Enable as many fields as supported by your device providing descriptive names for each. Note: The PDU will always be forwarded in Field1. 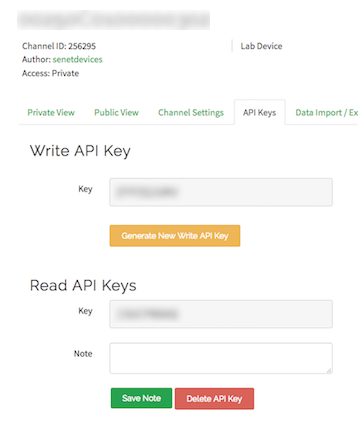 Click on the API Keys table, view the read/write api keys for this channel. The Write API Key will be needed when setting up the notification target. Specify the "Write API Key" into the "API KEY" field of the Notification Target.